Much of the information provided on this page has been taken from Choices in Deafness- Parents’ Guide to Communication Options (3rd, 07) by Phd – Schwartz, Sue [Paperback (2007) This material is reproduced with permission of Sue Schwartz, PhD. 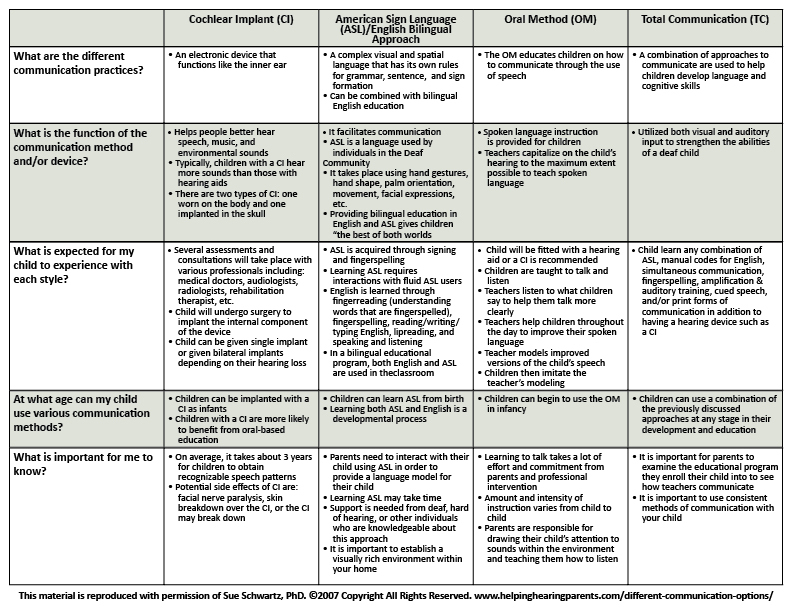 Listed below is a graph that shows various methods of facilitating your child’s ability to communicate. Please note that this list is not expansive. It was simply the goal of the author to provide you with a base knowledge of several styles. If you wish to read more about different methods of communication with deaf children, the book Choices in Deafness: A Parents’ Guide to Communication Options (3rd edition) edited by Sue Schwartz, PhD is a fantastic resource. Parent Tip: Many people will have an opinion on what method you should use to help facilitate communication with your child. Remember that YOU are your child’s parent and you undoubtedly will make the best decision for your child and his or her future.